Eyes secrete fluid continuously, also known as tear film, which cover the eyes and remain stable between each blink and prevent the eyes from becoming dry. This tear film keeps the eyes clear with stress-free vision. Dry eye syndrome is a disease in which there is high tear film evaporation or low tear production thus eye is unable to maintain a healthy coating of tears. So, a healthy tear film on the eye is essential for good vision. Population affected with dry eye syndrome is increasing because of many underlying causes of the disease. It is more frequent in old age; young generation is also affected by the disease because of change in lifestyle, poor dietary intake, more habituated towards mobiles and laptops, frequent travelling and rising pollution levels. Malnutrition resulting from vitamin A deficiency is also common cause of dry eye syndrome in some parts of the world. Other common causes include dry environment or workplace, medication, complications arising from eye surgeries and as a result of autoimmune disorders. Dry eye syndrome treatment can be done by knowing the underlying cause of disease. Various methods include lubricant treatments, anti-inflammatory treatments, autologous serum eye drops and surgery etc. 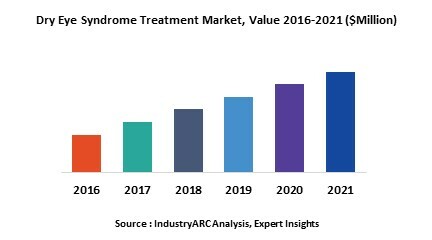 There are various key factors driving the growth of dry eye syndrome treatment market like increasing prevalence of the disease, increasing awareness about the disease, demand for better treatment options, impact of other diseases like Diabetes, Sjogren's syndrome, Vitamin A deficiency, Lupus scleroderma and Rheumatoid arthritis. Other drivers include focus towards development of novel technologies and contribution of non-governmental organizations towards the disease. This report provides information on dry eye syndrome treatment market size for the year 2014-2016, and forecast of the same for year 2021. It also focuses on market drivers, challenges, restraints, market dynamics, growth indicators, competitive landscape, potential growth opportunities and other key aspects with respect to dry eye syndrome. The prevalence of the disease is high in APAC region compared to USA and Europe. China and India are potential markets for dry eye syndrome due to high prevalence of the disease, growth in the market for the disease is expected due to growing population, environmental factors and lack of awareness. USA and Europe have better treatment options and high awareness about the disease and they remain good market for dry eye syndrome. 13.7. Merck Sharp & Dohme Corp.
13.9. Kissei Pharmaceutical Co., Ltd.
13.10. Dong-A ST Co., Ltd.
13.11. Kissei Pharmaceutical Co., Ltd.